Lovely hotel and friendly staff We were very happy with our stay at the Rendezvous Hotel in Christchurch. 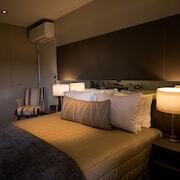 The staff were friendly and helpful and the rooms clean and comfortable. Easy walk or take the team from just outside the building to see the sights. Great stay at a very convenient location Or stay here was overnight before flying home. The room had lots of space, was very clean and well appointed. Great location Small but lovely apartments in the city centre, central to everything. Staff were extremely helpful. This brand new hotel was everything you could ask for. Clean, comfortable and luxurious. The staff were amazing, friendly and helpful. Will most definitely be back. Internet was a bit hit and miss which is frustrating in this day and age. Free airport shuttle including wake up call at 4:00am a great service. Comfy bed and roomy unit. Onsite restaurant also very handy. Heading to Christchurch and looking for somewhere to crash? Book a sweet hotel room on lastminute.com.au. If our deals were on a dating app, you'd be swiping right on every one! With a whopping 72 hotels within 2 kilometres of the centre, the biggest hassle you'll face will be narrowing it down to just one. Don't worry about FOMO — stay near all the hustle at The George Christchurch and The Classic Villa. 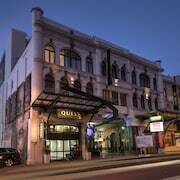 The Heritage Christchurch and the Eliza's Manor Boutique Hotel are also well worth thinking about. 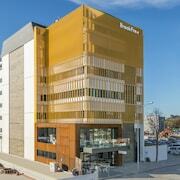 0.1 kilometres away from the heart of town is Christchurch City Centre, which contains 30 hotel options. 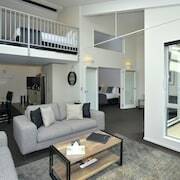 Think about booking yourself into the Novotel Christchurch Cathedral Square and Rendezvous Hotel Christchurch. Riccarton, 3 kilometres from the centre of town, is one more popular area. You'll be spoiled for choice here, with 27 listed options. 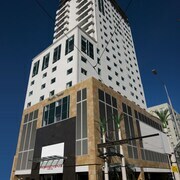 A few of the best are the Parkview On Hagley and Chateau on the Park - Christchurch, a DoubleTree by Hilton. How about checking out the Canterbury Museum? The Camelot Motor Lodge and the Milano Motor Lodge are conveniently close. How about Mona Vale? This awesome tourist sight is close to the Lorenzo Motor Lodge and the Aalton Motel. If Riccarton House is at the top of your must-see list, you might want to book a few nights at the Ashleigh Court Motel or the Amore Motor Lodge. The Commodore Airport Hotel and the Airport Palms Motel also have rooms ready for those who want to chill closer to International Antarctic Centre. Take your friends and family for a game of soccer or a relaxing morning stroll through Woodham Park. Need somewhere to crash close by? No worries, we've got your back. 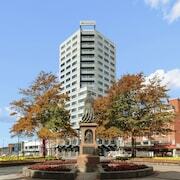 Rydges Latimer Christchurch and City Central Motel Apartments are just a stone's throw away. Admire the beauty of Mother Nature with a wander around Edmond's Factory Garden. Salerno Motel Apartments and Country Glen Lodge are two good accomodation options if you don't want to stay miles away. If you're travelling with your mates and your flight lands a tad earlier than theirs, why not head over to the Airport Delta Motel and put dibs on the best room? 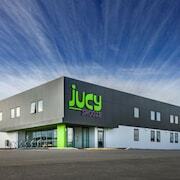 It's within a short commute of Christchurch International Airport, which is 9 kilometres from Christchurch's centre.